We generally advocate a 3 or 4 bucket diversified portfolio. 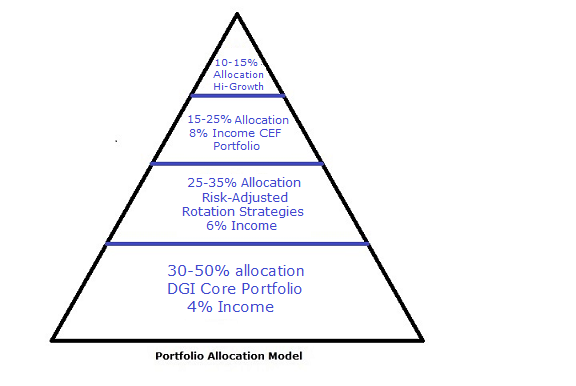 This “8% Income Portfolio” represents only one of the buckets in our overall investment strategy. This portfolio takes most of the risk while providing most of the income in our otherwise conservative strategy. Also, this is one of the two portfolios that do NOT employ an explicit downside protection mechanism. However, we have two indirect forms of downside protection; first, we maintain a 10-15% cash position. Secondly, the portfolio generates a high level of income on a monthly basis, which should help to stay calm during the volatile market conditions. If this income strategy is used as part of an overall multi-bucket strategy, we consider it appropriate for most retirees and near-retirees as well as younger investors. As it is true in most areas of life, one should pay attention to the right proportions. How much is appropriate for an individual? It would depend on the individual’s goals, risk tolerance, and personal situation. This income-centric portfolio was launched in October 2014 with two simple goals. The primary goal of this portfolio was to provide roughly an 8% income while preserving the capital. The secondary goal was to provide some capital appreciation over the long term (please see full disclosure at the end of the article). Since then, we have provided regular updates on the progress and performance of this portfolio on SA. You can read our original article here. You could also search for all the updates on our “Profile” page. Nonetheless, true to its name, this portfolio continues to generate high income, thus meeting its primary goal. Even though the total value of the portfolio is important, but it is secondary, and we know that the stock market never moves in a straight line. There will be ups and downs along the way. In fact, we should take advantage of lower prices when there are substantial discounts available. We did put some additional cash to work during this crash and updates were provided to the members of HYDIY marketplace service. Here is some brief background for the new readers. A total amount of $100,000 was initially allocated to the portfolio, and another $100,000 was contributed in the next 12 months ($8,333 in 12 installments). No more fresh money was added thereafter. The primary goal of this portfolio was providing a durable income in good times and bad. The investment strategy was to utilize CEFs (closed-end funds), which generally use some amount of leverage to generate high distributions. To start with, initially, we had chosen to invest in as many as 13 funds (11 CEFs, one ETN and one ETF) to provide us a broad diversification, high distributions, and exposure to different types of assets such as equity, bonds/credit securities, utility, infrastructure, energy MLPs, preferred income, floating-rate income, technology sector, healthcare, etc. Subsequently, during the following years, we have added three individual company stocks to the portfolio from the BDC/mREIT sectors. However, altogether, they form less than 10% of the portfolio size. MAIN, NLY, and ARCC are the only three individual company securities in this portfolio which are not funds (every other security is a fund). MAIN and ARCC are in the BDC sector, whereas NLY is an mREIT. ARCC was added in 2017. All three put together form only about 10% of the portfolio value. This is an ETN (exchange-traded note) sponsored by UBS ETRACS and is linked to the 2x leveraged performance of the underlying “ISE High Income Index.” We have not invested any new money in this security since mid-2015. If you were to look at it only from the price-performance point of view, you would find its performance to be disappointing. But that is just half the picture. Since this is a 2x leveraged product and provides hefty dividends normally in the range of 17-20%, after adding the dividends, it has performed reasonably well, providing positive returns on the invested capital when we include the dividends compared to a loss without including dividends. Even though it has performed well for our portfolio, this is still high-risk security; that’s why we have limited our position to roughly 2.5% of the portfolio size. That said, we intend to hold our current position and may add more at an opportune time. We like to caution that there are additional risks that come with an ETN product, which the investor should be aware of. They are widely discussed in many other articles on the SA forum. Tekla Healthcare is the only fund from the healthcare sector in our portfolio. The fund has a good past record. Even though the fund has struggled in recent times, the long-term future looks bright given the tailwinds to the healthcare sector. PFF is an ETF (not a CEF) and uses no leverage. It has roughly $15 Billion in assets and provides a broad and diversified portfolio of Preferred securities. The fund caps any single issuer’s weight at 10%, to limit concentration risk. PFF charges a competitive fee. These two funds overlap each other to some extent. DNP invests in the Utility sector, whereas UTF invests both in Utility and Infrastructure sectors. The Fund invests in US government and agency issued fixed income debt and senior equity securities, corporate bonds, mortgage, and asset-backed securities. It also utilizes an options strategy. The fund carries a premium most of the time and currently yields 11.5%. STK is an equity CEF and invests primarily in the technology sector. The fund currently yields 10.8%. Even though the fund deploys options strategy, however, most of the distributions come from capital gains. The fund is somewhat risky but can also provide high growth in good times. Due to the large appreciation since we invested, and some recent buys, the fund is just about 6% of our portfolio. Both RNP and RFI are from Cohen & Steers fund family and have some overlap in the types of securities they invest in. RNP is a sort of hybrid fund, which invests roughly 50% in real estate (REITs) and the balance 50% in preferred and debt securities. It also provides some exposure to international preferred securities as an added benefit. RFI is invested in equities of real estate securities. It also invests roughly 15% in the preferred securities issued by the real estate companies. Both funds have a solid history, provide decent yields and relatively low expense ratio. RFI does not use leverage, whereas RNP uses roughly 25% leverage. These are the two PIMCO funds in our portfolio. The funds are quite similar in terms of their assets and objectives. Both funds have a large exposure to mortgage debt. Due to a strong recovery in the housing market and steep fall in mortgage delinquencies, this asset class is likely to keep performing well into the future. We own both as they are equally strong performers. KYN is our fund for the MLP sector. The past few years have been tough for the sector. KYN provides the exposure to some of the best companies in the MLP sector without the headache of K-1 (partnership) tax treatment. NMZ is the diversified Municipal fund from Nuveen’s family. This fund is tax-exempt and should be used in a taxable account. If the portfolio was maintained in a tax-deferred account, we could replace NMZ by BlackRock Taxable Muni Fund (NYSE:BBN), Guggenheim Taxable Muni Fund (NYSE:GBAB), or Nuveen Build America Bond (NYSE:NBB). We made some regular and some opportunistic buys in the year 2018, reducing our cash reserve and increasing the income. (This includes $1,382 from securities already sold). The current yield-on-cost (YOC) is 10.07%. If you were to invest today in this portfolio, you would still get a very attractive yield of 8.27%. The current cash reserve of $30,806 represents about 12.6% of the portfolio. The table below shows the funds in the portfolio in order of performance (from best to worst) as of December 31st, 2018. The performance has been calculated and sorted after including the dividends. Provide roughly 2% or more capital appreciation over the long term. We earned an income of $20,084 during the year 2018. The total dividends in 2017 were $17,148, so we have seen an increase of roughly 17%. This is partly because of the fact that an increasing amount of cash was deployed. The total of dividends/distributions, since inception, stands at $64,103. The current yield on cost is at 10.07%. The projected yield on the current portfolio value (including the cash reserve of 12.6%) is also very respectable at 8.27%. Please keep in mind this cash reserve provides the extra margin of safety and lowers the risk profile of the portfolio. Capital preservation: Up until Nov. 2018, the portfolio was doing pretty well. However, the December market rout caught up with the portfolio as well. The portfolio value dropped by over 9% during the last quarter. Including dividends, the portfolio is up by 21.7% as of 12/31/2018. Morningstar portfolio calculates a little over 7% annualized return for this portfolio since inception. Our benchmark for this portfolio is not S&P 500, but a traditional stocks/bonds portfolio (40/20/40 Stocks/International Stocks/Bond allocation). We will assume that similar amounts were contributed on the same dates, and similar amounts were deployed. We will compare our income-centric portfolio with a hypothetical stock/bond portfolio with 40/20/40 allocation to the Vanguard Total Stock Market ETF (NYSEARCA:VTI), iShares MSCI EAFE – International (NYSEARCA:EFA), and (Vanguard Total Bond Market ETF (NASDAQ:BND). As you can see, in spite of a very tough environment in 2018 and especially in the midst of a rising interest rate environment, the portfolio has been holding on its own. Certainly, the market downturn has impacted the overall (total) returns, but that is to be expected. 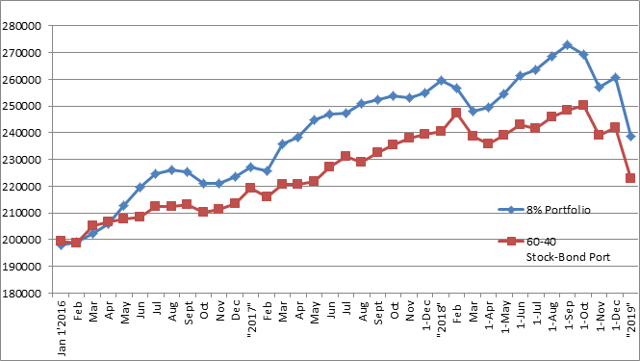 Further, the total return performance of the portfolio has been quite comparable to that of the broader market. What is more important for this portfolio is to provide increasing levels of income, which has been consistently rising. Even though some funds have cut distributions, some others have increased. Also, buying or adding money to some funds at the opportune time has helped a bit as well. We still have a large cash reserve of roughly 13% of the portfolio, which keeps growing every month with new distributions. Even though a large cash reserve provides an extra layer of safety and lesser volatility, especially during rough times; however, it earns no yield. We will continue to look for opportunities in the market. High Income DIY Portfolios: The primary goal of our “High Income DIY Portfolios” Marketplace service is high income with low risk and preservation of capital. It provides DIY investors with vital information and portfolio/asset allocation strategies to help create stable, long-term passive income with sustainable yields. We believe it’s appropriate for income-seeking investors including retirees or near-retirees. We provide six portfolios: two High-Income portfolios, a DGI portfolio, a conservative strategy for 401(K) accounts, a Sector-Rotation strategy, and a High-Growth portfolio. For more details or a two-week free trial, please click here or on the image below our logo above. Disclosure: I am/we are long ABT, ABBV, JNJ, PFE, NVS, NVO, CL, CLX, GIS, UL, NSRGY, PG, KHC, ADM, MO, PM, BUD, KO, PEP, D, DEA, DEO, ENB, MCD, WMT, BAC, UPS, WBA, CVS, LOW, AAPL, CSCO, IBM, MSFT, INTC, T, VZ, VOD, CVX, XOM, VLO, ABB, ITW, MMM, HCP, HTA, O, OHI, VTR, NNN, STAG, WPC, MAIN, NLY, ARCC, DNP, GOF, PCI, PDI, PFF, RFI, RNP, STK, UTF, EVT, FFC, HQH, KYN, NMZ, NBB, JPS, JPC, TLT. I wrote this article myself, and it expresses my own opinions. I am not receiving compensation for it (other than from Seeking Alpha). I have no business relationship with any company whose stock is mentioned in this article.